Although the battery is the most expensive part of a fully electric vehicle, most of the lifetime storage capacity is just rotting away. Why don’t we put it to work instead? Recently, the series production of Tesla’s Model 3 started. It is yet another of many models of battery electric vehicles (BEVs) available today. Over just a couple of years, they have evolved from prototypes and products for niche applications to the automotive mass market. This development was foremost triggered by the advancements of battery technology. They increased BEVs’ range and made them a real alternative to internal combustion engine powered vehicles in everyday life. 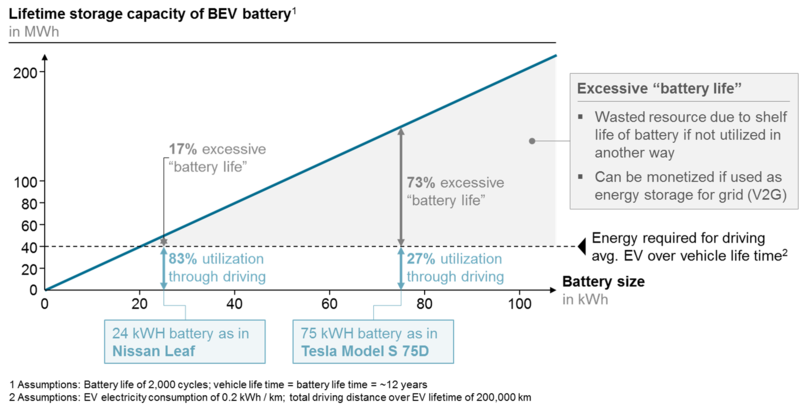 Over the last years, battery sizes in BEVs have grown to 40, 60 or even 100 kWh, which is required for a practical driving range. These large battery size hold an so far untapped potential. In order to understand this, we have to take a deeper look at batteries’ performance over time. Batteries have both a shelf life and a cycle life. The first describes the expiration date of the battery, quite similar to the “best before” date of any food we buy at a supermarket. For automotive batteries it is depending on the specific type but generally lies in the ballpark of ~10 to ~15 years. Hence the battery usually does not outlive the car itself. The cycle life on the other hand represents the number of complete charging and discharging cycles a battery can endure. It is depending on multiple factors. If we want to be on the conservative side, we can assume around 2,000 full cycles for automotive cells. Knowing the cycle life and the battery capacity, we can calculate the lifetime storage capacity of a battery. Multiplying 2,000 cycles with the battery capacity of e.g. 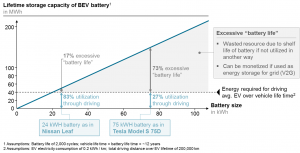 75 kWh (as it is used in Tesla’s Model S 75D) yields a lifetime storage capacity of 150,000 kWh over ~10 to ~15 years. That is far more than is actually required for driving the vehicle. According to NEDC, the mentioned Model S has a consumption of ~0.16 kWh / km. Over a lifetime distance of 200,000 km that sums up to 32,000 kWh, just one fifth of the battery’s lifetime storage capacity. Based on the driving style, the real life consumption might be a bit higher, but in any case the gap between available and used storage capacity is huge. And the larger batteries get, the more of their cycle life will go to waste. These batteries are assets that cost thousands of Euros and require valuable resources to produce, but today to a large degree we just let them just rot away. However, there is a smarter solution: Vehicle to Grid (V2G). Especially electricity grids that rely strongly on renewable sources like wind and solar have a problem: Electricity is not always produced when it’s needed and might not be needed when it’s produced. That’s where EV batteries come in. They can serve as buffer storage. If a BEV is for example plugged into a smart grid in the afternoon, the driver can set the “charge by” time to 7 a.m. the next morning. That means, that by 7 a.m. the battery will be fully charged again, ready to take him to work. In the meantime however, it can be charged from or feed electricity to the grid, depending on local demand and supply. That way, supply with electricity can be ensured without the need for utilities to invest heavily into grid extensions and energy storage. Instead they can give part of the savings to the vehicle owners via lower electricity cost to incentivize smart charging with V2G. That way, money can be saved by all the parties involved. Additionally, clean, renewable energy sources are supported. Sounds like a pretty sweet deal, doesn’t it?